I'm not sure how it happened, when it happened or why, but more and more, I am seeing an emphasis being placed on aerobic conditioning for baseball players. I wouldn't be at all surprised if it was something that was originally being pushed by people who sell conditioning programs and they figured that baseball was the one team sport market they had yet to penetrate. Then, like many bad habits in baseball that get perpetuated by ill-informed coaches, it spread from there. Proponents of aerobic conditioning for baseball players say that a baseball season is long and that without proper aerobic conditioning, a player will begin to burn out before season's end. When multiple games are played in a week (or weekend), players get tired and need that extra aerobic conditioning to keep them in peak shape for the later games. Really? A position player may not have three balls hit at them all game and half the time, when a team is up at the plate, everyone but the batter is resting comfortably on the bench. With the exception of pitchers and catchers, most baseball players don't do even five minutes of real, physical activity in a three hour game (and one could easily argue that even all the throws that pitchers and catchers make might not add up to a whole lot more than five actual minutes of activity). Even someone in terrible physical shape can recover from a few minutes of activity and be ready to go again the next day! If a player is burning out during a season, it has little to do with their physical condition. They are simply becoming mentally bored and are losing their motivation. The fact is, baseball is one of the least aerobic team sports on the planet. Even curling requires more aerobic conditioning than baseball! Baseball is a game of short, powerful bursts with extended idle periods in between. The most prolonged activity is running out a triple or inside the park home run. Being able to maintain a slow, steady one mile pace is hardly going to help with that! Pitchers are another story and I certainly agree that aerobic activity can help muscles recover more rapidly. As I mentioned in the article, Pitchers' Arm Injuries Can Be Prevented, stretching and a half hour on a treadmill or exercise bike after pitching multiple innings is always a good idea. With the exception, perhaps, of a catcher, few other players on a team are going to have sore muscles after a game unless they sustained an injury. Aerobic activity DOES have its place in baseball but that place is BEFORE a season starts. You definitely want every player to be in good physical condition when they start pre-season practice so by all means, work out on an exercise bike or treadmill during the offseason so that you don't become winded legging out a triple or running 30 yards to track down a fly ball. During the season, your training should be 100% anaerobic, though. Lifting weights will help build power to your swing and plyometrics will help strengthen leg muscles for the quick bursts of speed you need to pounce on a hard hit grounder or get that split second advantage on a line drive or get that extra half step jump when stealing a base. Wind sprints and "Indian runs" will help give you the quick bursts of speed you need for chasing down fly balls and running the bases. Cone drills that include side shuffles will help train your muscles for the quick lateral moves a baseball player often has to make. 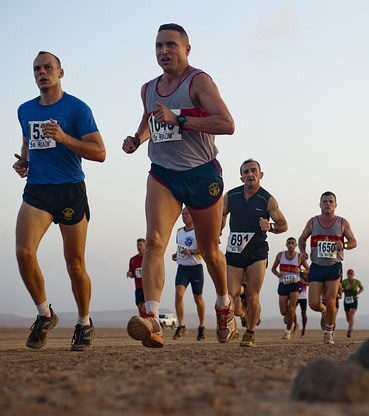 In the case of all anaerobic activity, the goal should be on increasing power, not stamina. With weights, adding weight or doing more sets (not repetitions) will increase your strength. With sprints, the key is to do more repetitions with rests in between - NOT increase the distance of the sprint. Anything much more than a 100 yard dash is only going to tire players out and won't help them achieve their ideal baseball shape. If you want to make it harder and develop players' leg muscles even more, do hill sprints. Don't get me wrong; there is nothing wrong with the healthy heart that comes from aerobic fitness training. There's a time and a place for it. The time is not during baseball season and the place is not the ball diamond!